United Launch Alliance’s Delta II rocket made its final launch Saturday after it took off from Vandenberg Air Force Base in California with a Northrop Grumman-built spacecraft designed to collect measurements of the Earth’s sea ice, glaciers and ice sheets. 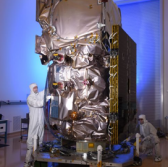 The Ice, Cloud and land Elevation Satellite-2 transmitted signals to ground stations in Norway approximately 75 minutes following launch and has started orbiting at an altitude of 290 miles at approximately 17K miles per hour, NASA said Saturday. ICESat-2 lifted off with the Advanced Topographic Laser Altimeter System designed to collect data on Antarctic and Greenland ice sheets through laser pulses. The space agency said it will activate ATLAS in about two weeks once the operations team for the mission wraps up the spacecraft’s initial testing. NASA’s Goddard Space Flight Center oversees the ICESat-2 mission and the ATLAS instrument for the agency’s science mission directorate. Northrop said it produced ICESat-2 at its Gilbert, Ariz.-based facility and plans to offer mission operations support to the LEOStar-3-based spacecraft through its site in Dulles, Va. The company provided four propulsion motors – Graphite Epoxy Motors 40 – meant to provide the rocket with additional thrust of 460K pounds during launch. Northrop also supplied composite fairing, second-stage nitrogen and helium pressurization bottles and other components for Delta II.